In a recent e-mail to my Northwest DXing buddies, I mentioned that I was building a new rack box to go under my new receiver and that I was putting in not one but TWO complete sets of “my much-beloved” audio switching network. Guy Atkins immediately shot back a query asking just which circuit I had in mind. I realized that, tho’ I believe that I wrote a small article about this for DX Ontario, I’ve really not shared my marvelous “find” as I should have done. It is classified as a “find” because Don Phillips published the original circuit in DSWCI Shortwave News in1998. My circuit is a slight modification of Don’s design. What this simple circuit does is take two audio inputs and put either signal in both sides of a pair of stereo headphones, or it puts one of them in each phone simultaneously. The device will also, simultaneously but separately, put either signal out to an outboard speaker. That is it! Sounds simple, but it is a wonderfully useful device. I first built my original version of this circuit to give me the best chance of comparing the DXing or listening performance of two receivers. Wearing stereo headphones hooked to this network, you can switch instantly back and forth between two different radios, with the flip of the Priority Switch. Or, if you throw the Mono/Binaural Switch to Binaural, you have one receiver in each ear. In the Binaural Mode, throwing the Priority switch swaps the inputs to opposite sides of the head. I’m not sure what this latter capability could be used for, but it is kind of neat. Generally, I drive the network from the External Speaker port of each receiver. I have never found any way to do a listening comparison between two receivers that is so effective as this. If running receiver comparisons were the only use for the circuit, it would still be worth having. It didn’t take me long, of course, to find a second major use for the circuit: “checking parallels.” In both SWBC DXing and International MW DXing, it is often possible to at least tentatively identify a station by simultaneously receiving a stronger signal from the same network being broadcast on another known station or frequency. (The two stations are “broadcasting in parallel.”) The usual technique for “checking parallels” is either by using two of the memory channels in the receiver and switching back and forth quickly or by using two radios and manipulating the volume controls appropriately. Either technique works well when both signals are relatively strong, but when the target signal is really “down in the mud” there is NOTHING like using this network to put one signal in each ear, simultaneously. There were several times when, with the old techniques, I would have sworn that two Indonesian stations were broadcasting national news from Jakarta in parallel only to find out, in “stereo” in the Binaural mode, that I was hearing the same female announcer but actually hearing her work in two different programs!!! Also, only when I began to use this network did I discover that All India Radio feeds the national network news programs to some of its regional outlets via satellite and some by land lines. Compared to the direct broadcast from New Delhi, about two-thirds of the regional broadcasts are delayed by a second or so. The delay itself is not very important, but not discovering it over several years of using the “old techniques” of parallel checking indicates how poor they really are. I discovered a third use for “my beloved” the first time that I took a miniaturized version of it on one of the Grayland DXpeditions. Since I normally only bring one receiver on DXpeditions, I soon discovered that I could use this network and a long audio cord to “listen over the shoulder” of one of my compatriots. I just plug the network into my receiver (Receiver A) and my compatriots’ radio becomes Receiver B. I can hook to some radios directly to my compatriots’ Speaker Out port. Others require us to use a “Y” connection at the headphone jack. Hooked up that way, when Dave Clark shouts “Holy S***, CHECK 972!! !” at 3 AM, I can be listening to his radio with one or both ears instantly while everyone else has to decide whether to abandon what they have been listening to themselves. On DXpeditions, this network is also useful to compare each other’s receivers while in pedal-to-the-metal DXing situations. A fourth use for this circuit is the one that has me buying more switches this week. Many of us have begun to use MiniDisc recorders rather than cassette tapes. Invariably, these wonderful recorders are stereo machines. DXing using two receivers, each feeding one channel of the stereo deck, sounds just wonderful, frankly. This is an especially attractive idea since the Fast Forward mode of MiniDisc technology uses a sampling rate that keeps the audio relatively understandable while speeding through the track, so you can whiz through the track later and not miss the ID. Its probably taken you much less time than it took me to realize that this networking circuit is perfect as an interface between the deck and a set of stereo phones, allowing you to listen to either channel A or Channel B or both, at the flick of a switch. Sony has recently introduced decks that will record at standard 74/147 min. stereo/mono length, and at two new stereo-only LP lengths of 160 and 320 minutes. The two new lengths are known as LP2 and LP4. I used one of these decks, the MDS-12, to test the whole operation. The largest concern, of course, was obtaining pristine channel separation. Notes on the MiniDisc Community web page indicate that a different algorithm is used to record at each of the three speeds. The LP4 encoding strategy takes advantage of the fact that, in music, about 90 percent of the same information exists on each channel. That is the only way, apparently, to achieve the radical compression necessary to jam 5 hours of quality stereo onto a MiniDisc. I was concerned that this approach would preclude the recording of totally separate tracks in LP4 mode. I was right. At fairly low levels of different audio on each channel, there did seem to be full separation. However, when I did the ultimate test – Buddy Holly’s “Rave On” at full blast on Channel A and WWV on Channel B – there was some crossover bleeding both ways. When listening to just one of the channels, it sounded like low-level sideband splatter on AM was also coming in from the other track. The problem was not very pronounced and, if put in a desperate situation, I might try to use the 5 hours of LP4 with two receivers, but feeding the channels with only mid-level audio. Running the same test Buddy Holly Test at the LP2 recording speed produced excellent results. Even Buddy’s hottest licks stayed right where they belonged, on Channel A! The same was true at the conventional stereo speed of 74 minutes per MiniDisc. So, with these newer decks, you can record over 5 hours with one receiver in LP4 mode or record two receivers for almost 3 hours in LP2 and this switching circuit works like a charm to listen to the result. I ran the Buddy Holly tests using an early generation Sony MiniDisc Recorder and found the same pristine separation of the two stereo channels: seventy-four minutes of excellent recording of two radios simultaneously. Using this circuit to monitor the recording as it happens and to review it later also works like a charm. 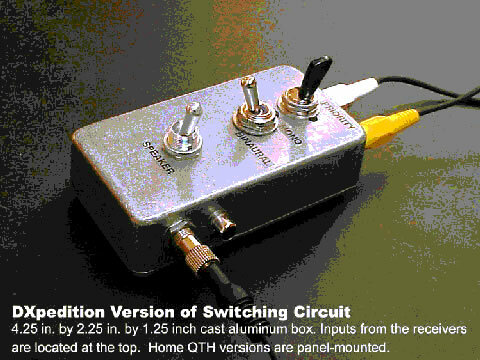 Don Phillips original DSWCI article stressed using high-quality, new switches since most users of this circuit quickly become addicted to switch flipping. I agree whole-heartedly. The best quality full-sized switches in a sturdy mount should still hold the parts costs at around $20.00 and will last you for many years. I’d like to thank Don Nelson and Guy Atkins for their usual excellent behind the scenes advice that refined this article considerably.